« Chicago Tribune prints important editorial. He is hailed by American black radicals and extreme left-wing whites as a hero. 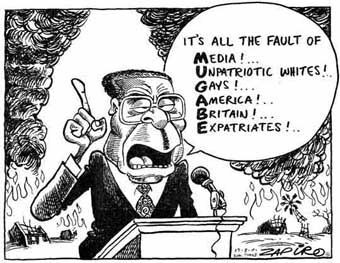 But Robert Mugabe has taken his country from the jewel of Africa, under British Colonial rule, to total desolation under his own tyrannical rule. Zimbabwe is in total collapse, with it’s currency losing most of it’s value in one day. A tidal wave of refugees could overwhelm South Africa, even as some refugees are being attacked by Mugabe supporters in South Africa. Influx from Zimbabwe to South Africa. Zimbabwe government claims secret American and British plot destroyed their economy. Left wing University of Massachusetts says Mugabe can keep Honorary Degree. This entry was posted on Saturday, June 23rd, 2007 at 3:01 pm and is filed under Uncategorized. You can follow any responses to this entry through the RSS 2.0 feed. Responses are currently closed, but you can trackback from your own site.